Calcite is a mineral that is treasured by collectors for its fascinating diversity. Though it is not a good jewelry stone due to its softness (3 on the Mohs scale), it occurs in a variety of crystal forms and in a huge range of colors. Nearly every calcite is unique. Some time ago we acquired some unusual specimens from the estate of a collector who had travelled the world acquiring rare minerals. Among them were some large gemmy crystals in a vivid reddish purple that we had never seen before. The material was labelled as originating from Spain. We faceted several pieces and were delighted with the color saturation and translucency. The cut stones displayed a wonderful glow when backlit. But we noticed the material was fairly soft. So we suspected it might be a form of calcite. We took a 16.78 ct polished gem to GIA in Bangkok for testing and they confirmed it was cobaltocalcite, a rare calcite colored by trace amounts of cobalt. Gem quality cobaltocalcite may be recovered from many sources around the world, but the vast majority of material from all these sources usually produces an aggregrate of small closely packed crystals on a rock matrix or larger single crystals of lower quality. Rough crystals that will cut large fine stones are occasionally found but are in the minority. Very fine, large gem-quality cobaltocalcite of over 10 carats with good transparency and distinctive saturated color can be considered extremely scarce. The large size, highly saturated reddish purple color and high degree of transparency makes this a notable cobaltocalcite. GIA was so intrigued by this material that they requested samples of the rough material to do additional analysis in their lab. They wrote up their findings in the Spring 2015 issue of their journal, Gems & Gemology. They discovered that the unusually vivid color of our cobaltocalcite was due to high concentrations of cobalt with possible contribution from traces of manganese. We now are pleased to offer a small number of these world-class gems to collectors. Click to see our collection of Faceted Cobaltocalcite. This month we feature some outstanding new acquisitions, including a rare pinkish-orange imperial topaz and a very fine matched pair of spessartite garnets. A stunning large Imperial Topaz from Ouro Preto, Brazil in a very rare color! This gorgeous gem is a brilliant pinkish-orange, one of the finest of all Imperial colors. This superb material is completely clean and has been fashioned in an elegant oval (15 x 10 mm) that will set up beautifully in a ring or pendant. Completely natural and untreated, this is an outstanding gemstone that you and your family will treasure for generations. A fine green Peridot from Burma with a lovely glow. This is a large clean gemstone that has been expertly cut to display maximum brilliance. This peridot really bursts with color from all angles. The cut and polish are both excellent. You will find it to be a very brilliant gemstone that will surely make a beautiful piece of jewelry. Guaranteed natural and untreated. A stunning matched pair of pear shape Mandarin Garnets. Superbly cut with nice proportions and polished to a high brilliance, these stones have a beautiful pure orange color and will set up beautifully in earrings. I'm sure you will be delighted once these stones are received and seen in person. Guaranteed natural and untreated. A very fine deep red zircon from Tanzania in a very large size. Beautifully fashioned in a portuguese cut to maximize brilliance, this is a very clean gem that will make an impressive ring or pendant. Guaranteed natural and untreated. A fine large chrysoprase in a lovely bluish-green color. This elegant pear shaped gem is 30 x 16 mm and is perfectly sized for an impressive pendant. Guaranteed natural and untreated. An exceptionally rare large faceted Cobaltocalcite from Spain. The color is a highly saturated reddish purple with superb translucency and an amazing glow when backlit. This rare gem has been certified as natural and untreated by the Gemological Institute of America (GIA). 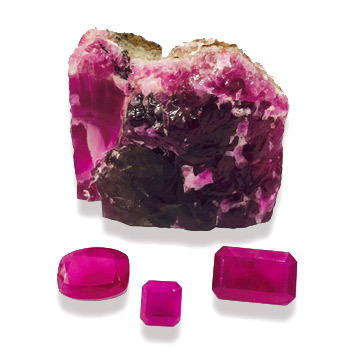 The GIA report also includes a Notable Letter which states that "The large size, highly saturated reddish purple color and high degree of transparency makes this a notable cobaltocalcite." Christie's sold a 21.71 ct Kashmir Sapphire ring for $4.2 million at their Important Jewels sale in New York in June. The sapphire was from the collection of Margaret Adderley Kelly and sold for $193,000 per carat, more than double the pre-sale estimate. 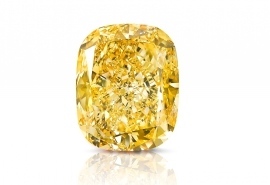 London-based Graff Jewellers has cut a 132.55 carat fancy intense yellow diamond that they have named the Golden Empress. One of the largest fancy intense yellow diamonds in the world, the cushion shape gem was cut from a 299 carat rough from the Letseng mine in Letsotho. The rough also yielded 8 other fancy yellows, the largest at 21.34 carats. Gems are cut to enhance the color and brilliance of the natural material. So different approaches are used according to the particular material to be cut. It is not easy to state hard and fast rules, but in general we can say that large facets will maximize color while small facets will maximize sparkle and scintillation. 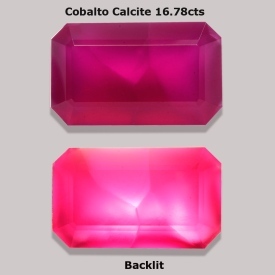 Gems with a highly saturated color and a deeper tone are often cut with large facets. Emeralds are traditionally given a step cut with very large facets to show off the color. Sapphire and ruby are most often give a mixed cut, with a brilliant cut (smaller facets) on the crown and a step cut (larger facets) on the pavilion. Lighter colored gems like morganite, aquamarine and some tourmalines are often given a portguese cut, since the many small facets not only provide more brilliance but also tend to deepen the color. The gems which are mostly commonly heated are ruby, sapphire, tanzanite, apatite, blue topaz and blue zircon. The temperatures used depend on the gem variety. Tanzanite, apatite and blue zircon will change color at relatively low temperatures (500 to 800 degrees centrigrade). Ruby and sapphire are usually heated at higher temperatures (over 1500 degrees centigrade), since the goal is often to reduce rutile silk which has a melting point around 1800 degrees. Blue topaz is irradiated then heated at low temperatures.